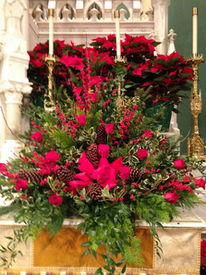 Please e-mail Robert Sullivan at musicatthebasilica@gmail.com for a current schedule or a link to use the Ministry Scheduler Pro App. 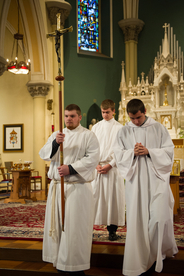 The Altar Servers prepares the altar and the sacred vessels at the beginning of the Liturgy of the Eucharist. The assist the celebrant or deacon at Mass especially, and at other liturgical functions. They also carry the processional cross, processional candles and thurible (incense). Extraordinary Ministers of Holy Communion - these persons have become indispensable part of the ministry of Communion in parishes and religious communities. Authorization was given in 1973 for the unordained person to distribute Communion. The circumstance warranting such an appointment was due to the lack of ordained ministers, a large group of communicants that would lengthen the service unduly, or the spiritual demands of the informed in homes or hospitals. The lector reads the lessons before the Gospel and the general intercessions. It is of the utmost importance that the lector prepare before reading at Mass, not only to understand what they are reading but to grasp the meaning of the readings and its significance in relation to the Liturgy of the Eucharist. If you are interested in participating in any of these ministries, please contact Robert Sullivan, Director of Music at 330.454.8044 x 201.